Tony Bellew is backing himself to take out Oleksandr Usyk, claiming he lacks the fear of the Ukrainian's previous opponents. Usyk has a perfect 15-0 record, with 11 knockouts, and takes on Bellew as the undisputed world cruiserweight champion. But the Briton considers himself to be different to the rest of Usyk's opponents, stating he has "100 per cent belief" in himself ahead of the November 10 bout in Manchester. 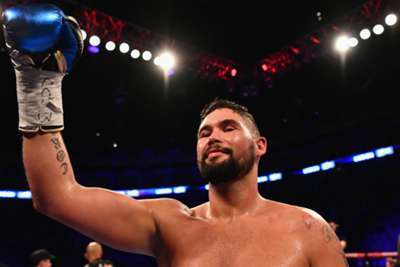 "The only thing I can say is - out of all the opponents he's faced - I am the only one who, when he looks into my eyes, will not be in awe of him," Bellew told Sky Sports. "I have no fear of him. "I have 100 per cent belief that I'm going to take him apart. Out of all the guys he's faced, none of the other guys believed that. They just don't believe it. I'm crazy enough to believe it." And Bellew thinks Usyk has had it easy so far in the professional sport, adding: "I have more knockouts than Oleksandr Usyk has fights. "While Oleksandr Usyk is a former amateur world champion, a former Olympic gold medallist, a current world champion, a current undisputed world champion, there are still some things that he hasn't experienced in the professional ranks. "There are some things that he's going to experience in the first round when he faces me. We'll just see how it plays out. "Has Oleksandr Usyk ever had to get up from a knockdown? Has Oleksandr Usyk ever had to come through a horrendous cut? "He has had to come back from being behind on points, to be fair, because I had him behind in the [Mairis] Briedis fight. He was down four-two on the cards after six rounds against Mairis Briedis. "He found a way back - mainly because Mairis Briedis took his foot off the gas and tired rapidly. But there's a reason why he tired rapidly. These guys don't look at the fight game and the boxing world in the same way as I do."